the title of this post is a misnomer but that is what i thought when i first encountered the problem. i use xmarks to sync web bookmarks in firefox across different computers. i also happen to use stumbleupon to discover new sites, but i do not use stumbleupon as my bookmark manager. 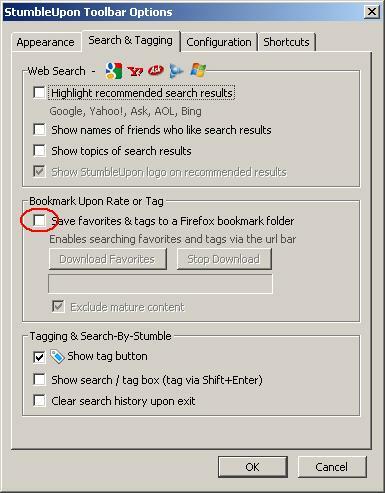 for my bookmarking needs i really use google bookmarks and the gmarks firefox addon. i noticed that when i favorited a web url in stumbleupon xmark automatically added the site to its favourite … now this was puzzling to me but i could not locate the connection between stumbleupon and xmarks. turns out that there was no unholy alliance between stumbleupon and xmarks. there is a feature in stumbleupon addon that also dumps the favourited url to the firefox booksmarks folder …. and that is why xmarks picks up the favourited url for syncing with other computers. so you see it was not xmarks fault at all.